Penzance offers a unique and somewhat laid back way of life, idea for those wishing to escape the trappings of modern city life in order to live on the quite Cornish Coastline. Penwith has a very low population density, far below the national and even European average due to the large amount of countryside. Recent times, and holiday homes, have caused house prices to rise above the purchasing power of many locals. Penwith council has recently pushed for developers to create affordable housing for first time buyers, numbering over 3000 dwellings in Penwith. There are a number of agency's which can help you find the right house for you, whether you are renting of buying. Within 15 miles of Penzance you have many smaller towns and villages including Newlyn, Heamoor, St. Just, Gulval, Lands End, Marazion, Paul, Sennen, Perranuthnoe to name but a few. Mousehole, Just a couple of miles around the bay was once voted the nicest village in Britain! 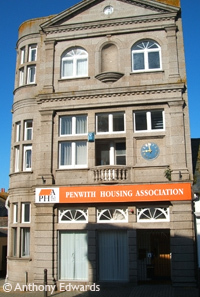 Penwith Housing Association (PHA) is a non-profit making organization building, improving and managing affordable housing in Cornwall. It is a member of the Devon and Cornwall Housing group. PHA is a registered social landlord with its work being monitored by the Housing Corporation and are registered with the Financial Services Authority as an exempt charity. PHA is governed by a board of management comprising tenants, councilors and independent members of the community. Formed in 1994 as a voluntary transfer from the local authority, funding allows maximum investment in maintaining existing homes and building quality new homes in Cornwall.